The Blue Sub kit is probably known to many as Clever Concept No. 24 (CC 24) or BlueSubSat as published in Hobby HiFi 4/2002. The kit is now available with a crossover revised by Bernd Timmermans. The combination consists of two small satellites and a subwoofer. 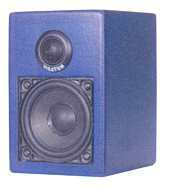 The cabinet type is purposely not airtight to reduce the quality of the bass driver. This is achieved by inserting a ventilation port filled with some cardboard and the supplied polyester wool. The loudspeaker is equipped with a Visaton CP13 tweeter and an SC 8N bass driver that is not available anymore; we recommend as subwoofer Sub10-60. Please bear in mind that the crossover components should be mounted close to one another, otherwise they won't fit into the cabinet.